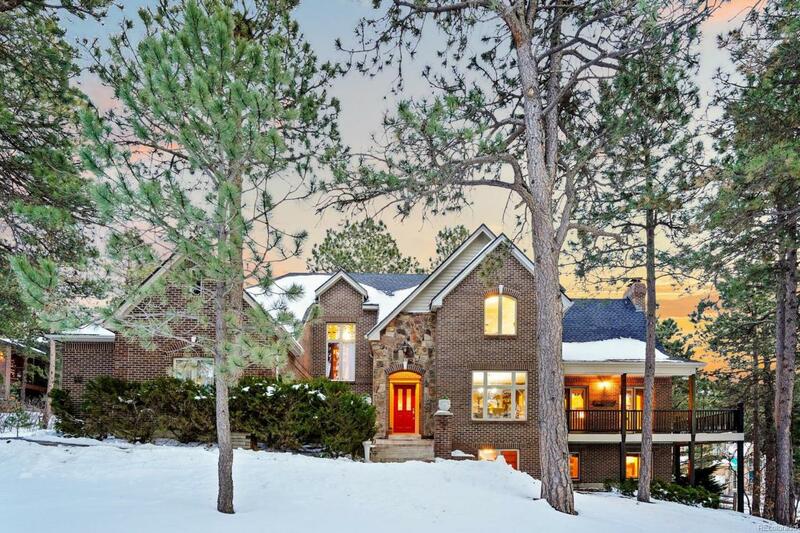 Nestled in the mature pines of Woodmoor, this beautifully distinctive, spacious, and all brick home sits on a large .75 acre lot with magnificent mountain views. The custom architecture and elevations are sure to impress. Wood floors throughout main level! Gourmet kitchen with SS Wolf Appliances, gas range, built-in microwave and double oven, wine fridge, long island with electric outlet, granite counters, updated sinks, and brick wall accents. Walkout basement with 2-bedroom suites, featuring walk-in closet and attached bathroom. Theater, entertainment flex space, multiple decks and patios make hosting easy and enjoyable! New roof, paint and stain, newer lighting fixtures and new high-end windows. This smart home features a security system, high efficiency boiler and allergy friendly baseboard heating. Master bath features beautiful custom onyx travertine tile and copper vessel sinks. Living room with elegant brick fireplace and much more. A beautiful home for all that you love! Offered by Abode Real Estate.